Magenta has just released its Spring collection! lots of really beautiful new images, familiar favorites of beautiful line art and many new silhouettes - both are wonderful for today's trending coloring styles and supplies. Line stamps for detail painterly look and Silhouettes that work so well with the watercolor brush markers! There are new stencils and tons of inspiration! you can go HERE to see the new catalog online and HERE to order! 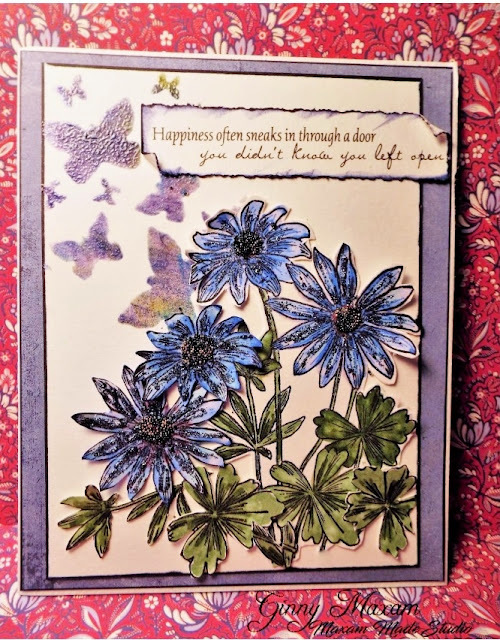 Today I've made a card with a traditional card using the Daisy Pair stamp, and a Butterfly stencil. Thanks for stopping by and I hope you love the new Catalog! Gorgeous flowers and I love the curled edges on your sentiment!